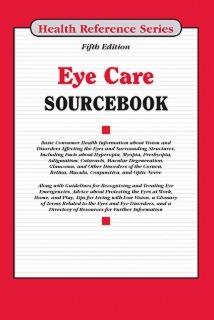 Eye Care Sourcebook, Fifth Edition provides information about common vision and eye-related problems and how they are diagnosed and treated. It includes facts about cataracts, corneal disorders, macular degeneration, glaucoma and other disorders of the optic nerve, retinal disorders, and refractive and eye movement disorders. It describes congenital and hereditary disorders that affect vision, and infectious diseases, traumatic injuries, and other disorders with eye-related complications. It also provides tips for recognizing and treating eye emergencies and suggestions to help prevent eye injuries. The book concludes with a summary of tips for living with low vision, a glossary of terms related to eye disorders, and a directory of resources for further help and information. Part I: Eye and Eye Care Basics explains basics of eyes and describes the most common methods of diagnosing vision and other eye related problems. It offers suggestions for maintaining healthy eyes and discusses common pediatric and age-related vision concerns. Finally, it describes ongoing research in the field of vision disorders. Part II: Understanding and Treating Refractive, Eye Movement, and Alignment Disorders describes common disorders affecting the eyes’ refractive ability, ability to move, and alignment, including astigmatism, hyperopia, myopia, presbyopia, and strabismus. It provides details about the different types of eyeglasses and contact lenses used to treat refractive disorders and describes how to fit them and care for them properly. The section concludes with a discussion of the most common types of refractive surgery. Part III: Understanding and Treating Disorders of the Cornea, Conjunctiva, Sclera, Iris, and Pupil discusses cataracts and provides a detailed description of treatments such as cataract surgery and corneal transplant. It also discusses conjunctivitis, dry eye, pinguecula, and other common disorders of the conjunctiva, sclera, pupil, and describes the methods used to diagnose and treat these disorders. Part IV: Understanding and Treating Disorders of the Macula, Optic Nerve, Retina, Vitreous, and Uvea provides information about macular degeneration and other macular disorders, glaucoma, optic nerve atrophy, and other disorders of the optic nerve, retinal detachment, retinopathy of prematurity, and other disorders of the retina, and disorders of the vitreous and uvea, including floaters, vitreous detachment, and uveitis. It details the signs and symptoms of these disorders and explains how they are diagnosed and treated. Part V: Eye Injuries and Disorders of the Surrounding Structures discusses chemical burns, foreign objects in the eye, and blowout fractures, and how to prevent these injuries. It includes a description of recommended forms of workplace and sports eye protection. It also discusses the most common disorders of the eyelids and tear ducts, including blepharospasm, chalazion, eyelid tumors, and blocked tear ducts. Part VI: Congenital and Other Disorders That Affect Vision describes the most common hereditary and other congenital disorders affecting vision, including albinism, color blindness, and Down syndrome. It provides information about infectious diseases, such as herpes, toxoplasmosis, and trachoma, that affect the eyes, and describes diseases and injuries, including diabetes, multiple sclerosis, strokes, and traumatic brain injury, that have eye-related complications. Part VII: Living with Low Vision defines what is meant by the terms low vision, legal blindness, and night blindness and provides tips for coping with low vision. It offers suggestions for home modification and provides exercise suggestions for people with low vision. The section concludes with a discussion of the laws regarding employment of people with low vision. Part VIII: Additional Help and Information includes a glossary of terms related to eyes and eye disorders and a directory of resources for further help and support.